A bootstrap circuit is needed when an Nch MOSFET is used for the high-side transistor of the output switch. 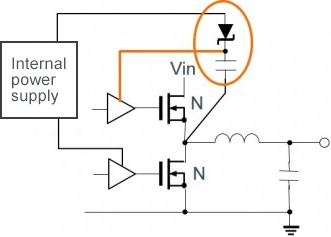 Nowadays a number of power supply ICs comes with a bootstrap circuit mounted, and thus an understanding of the operation of the bootstrap circuit in connection with the evaluation of power supply circuits may be helpful. Due to the low on-resistance, the Nch MOSFET can be used as a power switch to improve efficiency. Given the same on-resistance, the Nch MOSFET can be a lower cost option compared with the Pch MOSFET. That said, turning Nch MOSFET completely on as a high-side switch requires a high enough VGS, that is, a voltage higher than the drain voltage. Normally, because the drain voltage is Vin (input voltage), representing the highest voltage in the circuit, any higher voltage must be supplied externally. To generate that high voltage, a bootstrap circuit is used. 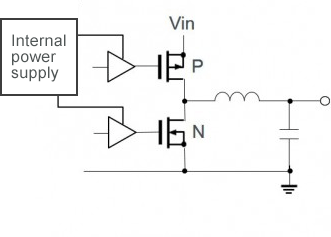 Simple in structure, a bootstrap circuit is a step-up charge pump composed of a switch, a capacitor, and a diode, where a voltage equal to the switch voltage (Vin) plus the internal supply voltage is used as the gate drive for the high-side Nch MOSFET. Nch MOSFET, low in on-resistance, helps to improve efficiency and provides a low-cost option. Use of the high-side transistor as an Nch MOSFET requires a VGS higher than the drain voltage. The voltage from an internal supply for internal circuit may not be high enough to drive the Nch MOSFET. Lately, Nch MOSFETs have been mainly used for the output switching transistors in medium- or larger-power circuits, fueled by a trend that gives priority to efficiency at the expense of a modest increase in the number of components required. More recently, there has been an increase in the use of circuits incorporating external diodes as a way of cutting the number of required components. Incidentally, for the same reasons as those mentioned above, bootstrap circuits are also used in nonsynchronous rectifying circuits. Beyond the Nch MOSFET, bootstrap circuits are also applied to reduce the saturation voltage in circuits that use bipolar NPN transistors. ・The Nch MOSFET, low in on-resistance, helps to improve efficiency and also provides a low-cost option. ・The use of the Nch MOSFET in the high-side transistor requires a bootstrap.